Results: Lucky 13's Megabattle 5: Why Would They...? As battle raged across the tomb world of Glavinus 5/7 between the Imperium and the Tau, with Necrons being awakened all across the forbidden world's surface by the combat, the High Command of the Mordant 13th concentrated the efforts of much of their rank and file infantry, tanks and APCs on the desert outskirts of one ancient ruin, where a terrible precedent was being set--the Necrons and Tau were formally allying. 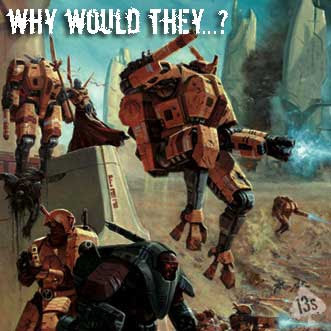 With space marines from the Howling Griffons, Jade Legion, Crimson Wing and other chapters in support, along with radical Ordo Xenos Inquisitor Rhadamanthus Goh under the close supervision of puritan Ordo Hereticus Inquisitor Augustus, and a small but determined detachment of allied Eldar, the Imperium eschewed superheavies and titans for precision strikes to attempt to seize the critical objectives and split the nascent Necron/Tau alliance; in opposition, multiple Necron lords, three Monoliths, the Nightbringer and the Deceiver, and a massive Tau fire cadre rallied around an uplifted Necron Pylon superheavy. Things appeared hopelessly bleak for the Imperium from the outset, as both an uncharacteristic timidity by the Astartes and an horrific display of inaccurate shooting made the oncoming Necron/Tau alliance appear unstoppable--especially when the Necrontyr played a 'secret weapon:' the unleashing of several captured Tyranid gargantuan creatures, which reaped a deadly toll on the Imperial lines. Things reached their nadir when a space marine librarian wheeled his bike to stave off a Tau flank attack--and immolated himself with his own psychic power. As the Imperial line faltered, however, Inquisitor Augustus abandoned his watchkeeping role and led an Imperial charge from the very front, crossing the boobytrapped highway which demarked each front line first and heroically rallying Imperial forces. As tanks, dreadnoughts and APCS of every description disintegrated around it, a lone Howling Griffons Rhino surged after him, seemingly indestructible even when the Pylon itself turned upon it; the Mordant High Command proper arrived to contest the central objective; and Howling Griffon Sternguard and Crimson Wing terminators deep struck and droppodded into the very heart of enemy lines to wreak havoc. Concentrated Jade Legion Whirlwind Suppression Force fire whittled one Necron flank down until they phased out in the face of critical losses...and at the end, the result hung in the balance. At that moment, Rhadamanthus Goh risked once again the wrath of his allies and reached out with his experimental radical psychic powers to seize the mind of one of the Tyranid monstrosities, and turn it against the wall of Necron Monoliths which appeared would carry the day. His effort was successful, and the monstrous Exocrine's bioweapon lanced out at his psionic command with destructive power...but the Monolith's living metal shell held. Invigorated, the Necrons moved their Monoliths to seize one objective and contest another, the Tau swarmed forward with their skimmers, battlesuits and Remora flyers...and the moment of possible Imperial victory slipped away. The Necron/Tau alliance won a technical victory, seizing the central objective with one Monolith and contesting the space marines holding the objective in Imperial territory with another; the carnage aswirl around the objective in Necron/Tau space--with Sternguard, terminators, droppods, superheavy Pylons, Hammerheads and C'tan bashing away at each other--saw all objective-seizing Troops units swept clear by mid-battle, leaving it completely unclaimed. However, by completely phasing out one entire Necron army, the Imperials achieved a 'bonus' objective...leaving the bloody struggle for this critical point on Glavinus 5/7 a judged Draw. Kudos to all the players who participated in Megabattle 5 of the Lucky 13s Campaign in North Texas; although the roughly 15,000 points in play was not enormous in scope compared to some previous campaign conflicts, the day saw all four turns of a standard Apocalypse game completed, including deployment, in little over six hours--with plenty of memorable moments and high adventure afforded by the efficiency of play and sporting atmosphere on display. While there will still be opportunities to see multiple superheavy vehicles take the field and armies in the tens of thousands on either side clash at arms, this 'compact Apocalypse' template is also one which will see future play, without doubt, after the day's success! As for the Mordant 13th--on to the climactic event of the campaign, Megabattle 6, on November 8th, 2008! 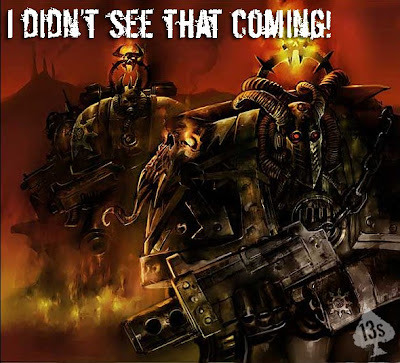 The third mega-battle in Games Workshop's year-long Apocalypse Campaign, The Lucky 13s, 'I Didn't See That Coming!,' will take place Saturday, May 31st--pitting the Mordant 13th Imperial Guard and the Daemonhunters of the Ordo Malleus, with their Imperial allies, against the might of the arch-foe...the Ruinous Powers of Chaos! The pattern for HobbytownUSA Dallas' event will closely follow the largely-successful model of the second mega-battle in March: participation slots will be limited to numbers the Game Hall can comfortably handle, and interested participants must sign up in advance, no later than by the completion of the Daemonic Council Painting Event the prior Sunday, May 25th, and be committed to having internet access and some amount of available time for the week immediately leading up to the mega-battle on the 31st, as both sides will again coordinate amongst themselves during that week to present one army list, representing the entire side, Imperial or Chaos. The Sign-Up list will be available at HobbytownUSA Dallas Friday, April 25th. Paid members of the HTUD Game Club will get first shot at signing up for slots, through the end of April; everyone will be able to fill remaining open slots beginning Thursday, May 1st. Remember before signing up and committing to the mega-battle that the Ard Boyz Regional is that same day, as well as the IPMS Regional convention. Play will begin immediately when HTUD opens Saturday at 10am, and will run at least until the store closes at 6pm, with the possibility of running past closing, as was managed recently for the Ard Boyz tourney, if store manpower allows. The Lucky 13s Campaign has been an enormous success in North Texas thus far, and these mega-battles are its centerpieces. 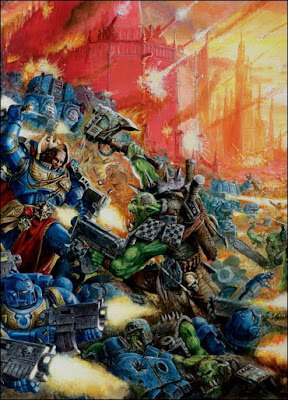 This clash will be monumental, as waves of Grey Knights, Inquisitors, Space Marines and, of course, the Lucky 13s face Chaos Space Marines, Daemons, Traitors, Heretics, Cultists, the Daemonic Council, and Ahriman of the Thousand Sons himself in the third mega-battle of the Lucky 13s Apocalypse Campaign, 'I Didn't See That Coming!,' Saturday, May 31st, at the Game Hall of HobbytownUSA Dallas! 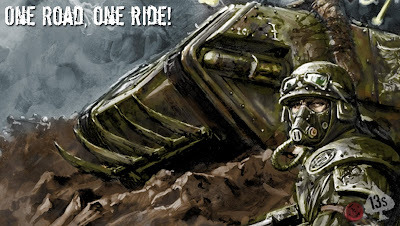 All specific conditions following supersede any information presented in the general scenario for the third Apocalypse Campaign mega-battle found on the Games Workshop website, upon which it is based. SETUP: No Mans Land will be pre-set on the diagonal centerline of two 6'x4' tables, creating an 8'x6'' battlefield. The Imperium will have choice of deployment zone, due to their successes in the prior mega-battles. A Chaos Summoning Circle will then manifest in the center of the table, in No Mans Land, representing the focus for the Warp Rift Apocalypse Formation. This will count as a Vital Objective per the Apocalypse Rules. Three additional Objectives will then be declared for each side, within their Deployment Zones. These physical Objectives will replace the Army Agenda objectives utilized in mega-battle two--but players in this event who achieved their Army Agendas in the previous game *will* still get their special benefit. Participants must be able to field a force themed to this specific mega-battle. In this confrontation, the Mordant 13th and its allies will be confronting all the varied force types aligned with the Ruinous Powers of Chaos. There will be six 'Imperium' slots available for sign-up. Imperial Guard players may sign up for four of the six slots, and two will be specifically dedicated to Guard, including the Mordant 13th; because the Imperium is ready for the upcoming attack, two slots will be dedicated to Daemonhunter players. The remaining two are open to any other Imperial army types--Space Marines, other Inquisitorial types, etc.There will also be six 'Chaos' slots available for sign-up: these may be of any Chaos composition--Chaos Space Marines, Daemons, Lost and Damned, Imperial Guard Traitors, etc--except that slot 1 is reserved for a player committed to bringing the chief villains of the mega-battle, the Thousand Sons, in strength. These 12 will be the primary participants in the mega-battle, playing on the primary table, and the only ones which can directly win or lose the game. However, because both sides are ready for this clash when it finally comes, each has established their artillery in the hills above the battlefield ruin, and this will be represented by play on an additional unconnected 6'x4' table. There will be two slots for each side available for sign-up--an 'artillery' player, whose job it will be to lob indirect fire onto the primary table, and a 'strike force' player, whose job will be to silence those big guns. Players who sign up for either the Imperium Artillery player slot or the Chaos Artillery player slot *must* have completed sufficient models to represent at least one minimum-size appropriate Apocalypse Datasheet (either a Basilisk Battery or Suppression Force), which they will get to field free. Any additional forces--and all Strike Force forces--must come from the side's total points allotment. Strike Force units must comprise of units which are either Flyers or can Deep Strike, to reach their targets in time. Players who sign up to participate in the mega-battle on the artillery table will be able to enjoy a unique role in the game, but must understand and accept that, because they will have to play their game turns in concert with the pace of the main table, their amount of 'down time' on the day may be correspondingly higher. Following the May Lucky 13s Event The Daemonic Council on Sunday, May 25th, the players on each side will be provided with the names and email addresses of their teammates, and each side will have the entirety of the following week to coordinate with each other and the Event Moderator on everything relevant to the Saturday mega-battle. A 'Commanding General' will be assigned for each side in advance, and collectively the players on each side will determine which player will brings what units to the mega-battle, and in how many points; a player on each side will create an overall army list *for the entire side* (just one list, including everything, though broken down by individual participant's 'armies'), a copy each of which will be presented to the moderator and the opposing 'Commanding General' on the day of the battle. Strategy, tactics, force composition, Apocalypse Assets--everything will be decided by the participating players themselves, in the week leading up to the mega-battle...essentially extending the event to a weeklong amount of fun, instead of just one day of it! All models used must be at least assembled to properly represent their weapons and equipment, and should preferably be at least primed; priority in assembling the joint army lists for each side *must* be given to fully-painted models. In addition, priority should be extended to those things which make Apocalypse battles unique: superheavy vehicles, datasheet formations, custom-created models, etc should all be 'first choices' in the unified army list. 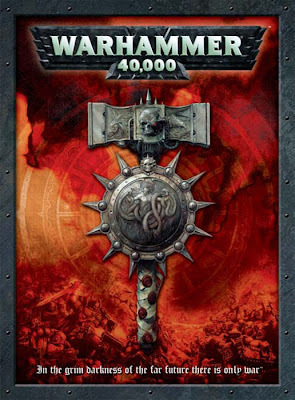 As result, players will not have equal points amounts, nor should they expect to; every player will have a sufficiently large force to occupy them on the day, but one player may wind up bringing only 1000 points of his models, while another may bring 3000 (given the priorities noted above). Apocalypse Datasheets from the Apocalypse rulebook, the official GW website, and the Forge World Apocalypse book are accepted without review; any vehicle or formation using a Datasheet from any other Forge World source, any unofficial website or created through VDR *must* be pre-approved by a moderator before its inclusion in any army list for either side. Before signing up, participants must insure they are able to devote the time to the event it will require; everyone understands the demands real life can make, but if real life on that weekend might require an early departure, players should not sign up to participate. The mega-battle will start as soon as HTUD opens at 10am; participants can either bring a lunch or go in with other participants to have pizza delivered; and there is a good possibility HTUD will allow play to continue beyond the 6pm store closing, in order to complete more turns of play. No player should sign up if that commitment of time is impractical for them; in addition, there will be a Friday night session prior to the Saturday mega-battle, from approximately 6pm until 8pm, in which all players will be asked to assemble at the HTUD Game Hall, make their deployment bid, and deploy their models onto the tables. This will allow Turn One action to begin almost immediately upon the store opening on Saturday. Players will *not* be excluded from participating in the mega-battle if they cannot attend this Friday night session--however their models will have to come on from Reserve beginning with Turn Two on Saturday unless the player can make some arrangement with his teammates to deploy his models for him on Friday night. Participants must insure they can play on the day without having to be responsible for non-participants in the Game Hall; space is limited, and is there for event participants. Note this in no way excludes parents from being present for their participant children, such oversight is welcomed; but participants should not sign up if *their* responsibility would include oversight of non-participant children--there is insufficient space and too much going on. Note also that this in no way excludes short term or visiting spectators; such support is encouraged for participants, as is the opportunity to show off the hobby to potential future players. The key words are 'short term' and 'visiting:' the Game Hall is not an acceptable venue for non-participants to eat, babysit, converse loudly or engage in other potentially distracting activities on a day when it has been reserved for a mega-battle; the participants in that event have devoted a great deal of time in preparation for same, and deserve a venue conducive to fully enjoying it. The Chaos side receives the Warp Rift formation at the center of the table free--but must pay for the models which use it from their 13,000 point allotment. The Imperium receives all Grey Knight units at half their Codex points cost *IF* the models are fully-painted and based; otherwise they cost their normal points to field. Each side receives one minimum-size artillery Datasheet formation (Basilisk Battery or Suppression Force) on the artillery bombardment table free, if the models representing the Datasheet are at least fully assembled; they may increase the size of that formation or add formations at cost, from their 13,000 point allotment. The Chaos side will also utilize the Daemonic Council, composed of submitted models from the painting event concluding the Sunday prior; special rules (including cost) for this unit will be provided. The sides have been drawn. 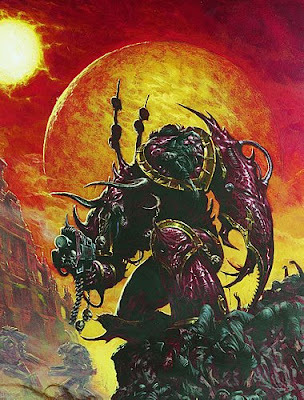 The Imperium has dug in, in the name of uncovering heresy...and surviving, to reveal it; the Powers of Darkness have responded, bringing all the forces of Chaos, including the Daemonic Council and perhaps Ahriman himself to contest the outcome. The stakes are monumental. Will you be a part of deciding the day? It is always worth noting that every model except one received at least one vote in some category. I am not sure it is worth noting that the only model which got NO votes was the one *I* painted, but in the interests of full disclosure, there you are :) The Chaos Spawn category was, curiously, the most hotly contested, with the model voted Favorite Overall a Spawn and both top finishers in the Favorite Youngbloods offering Spawn (Brady's Spawn was second in that category and won it when Bob's won Overall, and Blake's Spawn was second in the Youngbloods category, winning that when Brady's won in the Spawn category). Special mention should be made of Ashley McDaniel's Daemachinex Character model: it finished *one vote* behind Eric's Changer of Ways in that category, and finished third overall behind Bob's Spawn and Eric's Greater Daemon (and is probably the best painted model I have seen Ashley produce, besides). HobbytownUSA Dallas and Games Workshop provided all five winners with prizes of Warhammer and 40K model boxed sets--from Bretonnian Knights to a Khorne Lord to Tomb King Chariots to Goblin Spider Riders to a Carnosaur!--so get by HTUD at Walnut Hill/Central Expressway and admire the submissions in the game display cabinet, opposite the Mordant 13th High Command they will soon face on the tabletop; thanks again to HTUD and GW for sponsoring the ongoing Lucky 13s Campaign, and to the Daemonic Council participants for completing their models, and to such an excellent standard! The seals have been broken. The wards have been shattered. The thousand-year-imprisonment is at an end. And the Daemonic Council is loose upon the galaxy once more. Participants in the HobbytownUSA Dallas Lucky 13s Apocalypse Campaign banded together to create the Mordant 13th High Command Squad in March, to lead the 'good guys.' Between now and Sunday, May 25th, participants will have the opportunity to return the favour, for the 'bad guys,' by purchasing, constructing, converting and painting a model to represent the Daemonic Council of Colfax--which will then lead the Chaos forces the following Saturday, May 31st, in the third Lucky 13s mega-battle! Colfax was a system of Imperial worlds which, millennia ago, were corrupted by the Ruinous Powers. 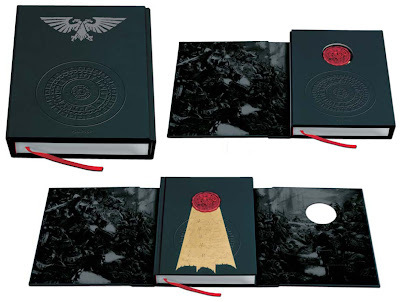 A gatherum of the most powerful daemonic entities completely enslaved the worlds, so totally that the only response the High Lords of Terra could make was exterminatus--obliterating each world, and every living thing upon it, in turn, until the daemonic leaders of the rebellion were trapped on the last surviving moon of the system. Instead of destroying it, however, and releasing the entities to the Warp, the Inquisitors of the Ordo Malleus contrived to seal the Daemonic Council inside a towering obelisk, making of the moon in its entirety a daemonifuge, an eternal prison for the rebellious daemons, then cast the moon adrift through space, and declared it perdita, prohibited from all contact. And so it--and they--remained until recent events, when representatives of a host of races were lured to the Prohibited Moon of Colfax by the false projection of the mysterious Warp signature which has been driving the campaign-across-the-galaxy of the Mordant 13th Imperial Guard. The races battled across the moon, until their efforts unwittingly burned out the hexagrammatic wards sealing the Council in their nether-prison: the obelisk faded from existence in this physical reality, and in a geyser of screaming Warp entities, the Daemonic Council returned. 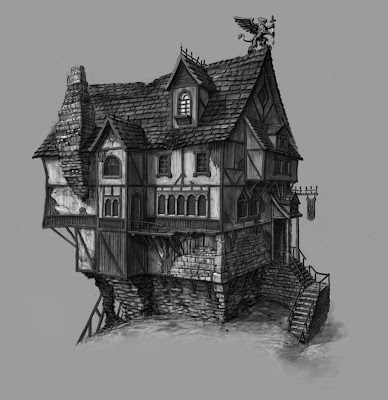 Participants who wish to contribute a model to the Daemonic Council may sign up to do so at HobbytownUSA Dallas, once the sign up sheet is formatted and posted in the Game Area. Unlike the High Command Group, which is now a permanent HTUD feature, the Daemonic Council will be central only to the upcoming May mega-battle, so participants *will* get to keep the model they contribute to it, once the mega-battle is completed, for use with their own armies. Rules for the Daemonic Council will be based on entries in the upcoming Codex: Daemons, and will be posted in advance. The Council will act as a single unit in the May mega-battle, essentially a 'super HQ' choice. 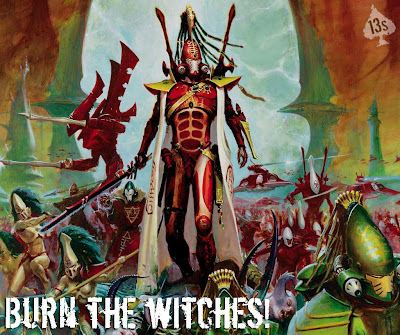 Interested participants will have the option of signing up for one of the six Council choices which require specific models--*or* they may create their own member of the Daemonic Council, but signing up for either a Daemon Prince or a Chaos Spawn. In the case of the former, the participant who signs for that choice MUST use the indicated model; in the case of the Daemon Princes and Chaos Spawn, players are free to use their creativity and imagination, with the caveat that their submissions must be Citadel miniatures or conversions primarily based on Citadel miniatures, and must clearly and recognizably represent the Daemon Prince or Chaos Spawn entry, using existing GW models and imagery as guidelines. Participants must have their model completed, painted and based by Sunday, May 25th at 1pm, when they will be gathered together and displayed for the week leading up to their showcase mega-battle the following Saturday. As with the High Command Group, participants and judges from HTUD will be allowed to cast a ballot for Favorite Model, with the winner collecting a prize from HTUD and Games Workshop, and there will be random prizes distributed to eligible participants, as well. 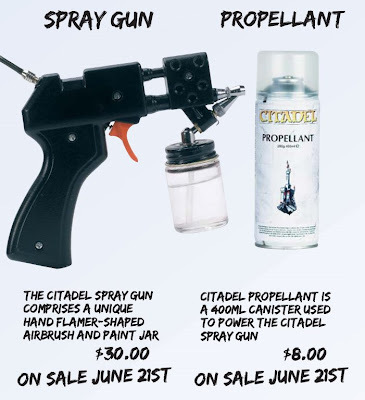 For further information, see http://www.adeptusnorthtexas.com or HobbytownUSA Dallas. Prepare for a storm of vengeance. Prepare for the coming of the scouring wind. Prepare for the wrath of the Daemonic Council! Please sign up in person at HTUD for the model you wish to complete. These models will remain yours to keep and use in your own 40K army; the only requirement is that they be submitted to HTUD in finished state by Sunday, May 25th at 1pm, where participants present will vote for their Favorite Model. The Council will then remain on display until Saturday, May 31st, where it will lead Chaos against the Imperium and the Mordant 13th in Campaign Mega-Battle Three! 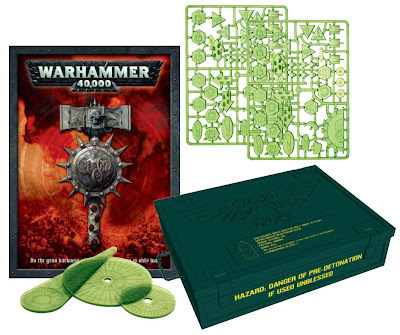 Specific models must be used where indicated in parentheses following; Daemonic Princes and degraded Chaos Spawn may be representative models of the participating player's choice from the Citadel Miniatures range. Event judges retain the right to disallow any model deemed inappropriate from inclusion in display, including eligibility for prizes and use in battle. Participants who sign up for a specific slot are both making a commitment to the event and denying that slot to other interested participants in turn; failure to complete the signed-for model on time could result in the participant being excluded from future Lucky 13s and other hobby events at this and related venues. Fourteen players found their way to the hostile surface of the Prohibited Moon of Colfax, and survived its perils--and each other--to reach the obviously-not-natural spire sitting menacingly astride its day-to-night terminator, and unlock its secret, in the first April Lucky 13s event, One Road One Ride, at HobbytownUSA Dallas. Players discovered that the rogue moon had been locked in stationary orbit by a tiny, brilliant and completely unstable white dwarf star (which they promptly dubbed Grombrindal). They battled over an 8'x6' Apocalypse table which represented this state, with one side overexposed by white light, solar flares and radiation and the other, across the terminator line, shrouded in night-fighting darkness. An additional unconnected table represented a warp gate at the far end of the moon's dark side, where competing vehicles could find themselves inexplicably hurled by the clash of energies at work on Colfax, and have to fight their way back. The race to reach the mysterious spire at the moon's center was a seesaw affair, with fast vehicles like Bob's deep-striking Ultramarines land speeder claiming it quickly, but failing to retain control of it long enough to decipher the arcane wards scrawled across it, to win the game. Alliances were formed--and then broken in turn--as players tried to find the perfect tactics for reaching the objective quickly enough to have a chance to win it, but not so quickly there were enough guns still active to knock them off of it. In the end, Ashley's Thousand Sons Defiler, Alex's Winged Hive Tyrant and Jack's Techmarine Razorback all came close, and Josh's Jade Legion Razorback (led by the wounded but still very-much-alive radical Xenos Inquisitor Rhadamanthus Goh) dropped its passengers and made a late run under the guns of alliances forged on both flanks...only to meet its fate at the claws of Brady's Carnifex, which then survived a hail of fire from every compass point on the table for over a turn to win the race for the mystery obelisk. The climax was tremendous, as Eldar, Chaos and Space Marine guns failed to bring the monstrous creature down--leaving the last player to move in the turn, Chad, to try a sweeping tank shock with his Falcon in a final desperate gamble to dislodge the Carnifex and keep the game going. The moment heightened as every consequence, intended and unintended, was considered, and every response calculated: the Falcon crested into the difficult terrain around the objective, surviving rolls which might have brought it down; the Carnifex chose death or glory, with virtually any result but snake-eyes insuring the destruction of the Eldar skimmer--which it promptly rolled; but then everyone remembered the unpredictable energy shields around the obelisk, the roll for which displaced the Falcon back off the spire. The Carnifex met the victory conditions, the ancient hexagrammatic wards carved into the towering spire flared brilliantly to life and then burnt out, the structure itself lost its integrity in the physical world before the surviving warriors' eyes, shimmering out of existence--and allowing a geyser of long-trapped Warp entities to scream into existence from whence they had so long been imprisoned. The secret of Colfax moon stood revealed: the entire moon was a daemonifuge, a millennia-old prison holding a gatherum of mighty daemonic entities--known as the Daemonic Council--which had once corrupted and ruled over an entire Imperial system...and with the wards and seals destroyed, the Daemonic Council was free again, to lead the Forces of Chaos against the Mordant 13th, in next month's Lucky 13s mega-battle! As for the winning model, it reaped the benefit of proximity to so much unleashed protective energy: that specific model will benefit from a 4+ Invulnerable Save in that mega-battle next month. Other highlights (and lowlights) of what was a fine afternoon of multi-player gaming included David's Wave Serpent suffering a crisis of confidence in the first turn and deciding NOT to race onto the objective, as he had built it to do--whereupon it was immediately immobilized and spent the rest of the game sitting in the blinding light of Grimbrindal, doing nothing; Blake's Thousand Sons Rhino racing to protect Ashley's flank and weathering an amazing volley of fire from a fusion-gun-wielding squad of Fire Dragons--only to be immobilized by a lucky shuriken-cannon shot; Kyle's Ultramarine Land Raider Terminus, undoubtedly the most dangerous weapon on the table, suffering bad break after bad break, from turns of star-blindness to actually shooting itself, when one of its rounds of fire drew a solar flare from the white dwarf star to it and rebounded lascannon fire back at it; everyone on the dark side of the moon rolling laughably for night-fighting range, but especially Blake's Thousand Sons and Jimmy's Ultramarines Predator, which stood less than two feet from each other for more than half the game without ever getting off shots; poor Forrest's Exorcist, without doubt the most-shaken vehicle in the game; and Barret, playing his Deathwatch dreadnought 'Thunderbolt' in his first-ever game of Warhammer 40K, surviving the entire battle without a scratch, despite being shot at by--at least--a Predator, a Falcon, some Striking Scorpions, a Fire Dragon Exarch with a Fire Pike and a Defiler, being assaulted by a Winged Hive Tyrant, and--in the final turn--being tank shocked by Eric's Space Wolf Land Raider...which Barret death-or-gloried and, with one lascannon shot, blew to wolfy smithereens. There are still some kinks to work out with these 'massively-multiplayer' battles (to borrow a phrase), the down-time between turns and the general level of talk when players are not directly engaged which results, probably foremost. But some of the steps undertaken this time around--particularly the compactness of forces controlled by each participant--seemed to go a long way toward remedying some previous issues (we easily finished the game in under three hours, for example)...and the synergy which comes from having over a dozen enthusiastic hobbyists all playing toward one goal, forming and breaking allegiances and sharing (or keeping) secrets is, I think, undeniably worth it. So expect to see variants of events like this again, soon...perhaps the next time with *all* superheavies! The second April Lucky 13s stamp-eligible event concludes next Sunday, as players complete and submit 1500-word-maximum short stories featuring one of their Lucky 13s Campaign-participating characters. I am hoping the entries for this event will further personalize future battles...and illuminate the nature of some of our deepening grudges. The first May Lucky 13s event will spring *directly* from today's multi-player battle, as the Daemonic Council freed by the race to the obelisk will manifest to wreak their vengeance upon the Imperium of Man, in a painting contest to culminate Sunday, May 25th. Interested participants will be able to sign up at HobbytownUSA to submit models (which, unlike the Mordant 13th High Command, will in this case remain theirs to keep and use after), and then the entire Council will lead the Chaos assault against the Mordant 13th in the May 31st Lucky 13s Campaign mega-battle. Sign up at HobbytownUSA Dallas for that May 31st mega-battle will be announced soon, once the specifics of the scenario are released by Games Workshop.